In the final announcement from today’s press event held by Apple we have the new iPad Mini with Retina Display. Offering the same form factor as the existing iPad mini, the new Retina Display version will also include the A7 chip, 5MP camera and forward facing iSight camera. As with the existing line-up there will be 16, 32 and 64GB models with WiFi or with WiFi and Cellular. Don’t let its size fool you. 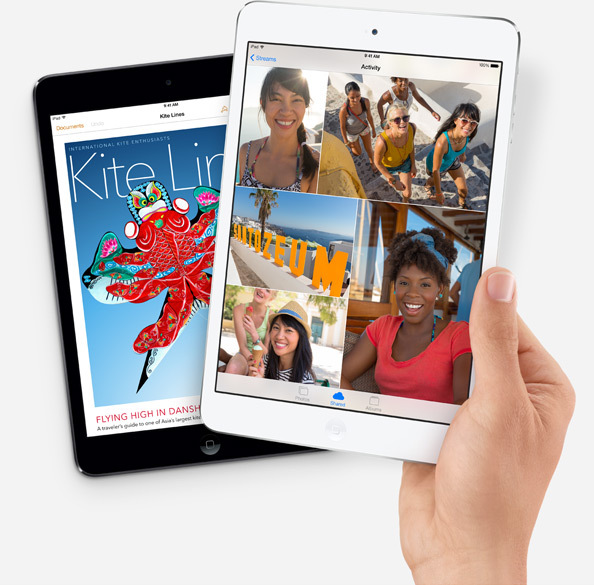 iPad mini is powered by the new A7 chip with 64-bit architecture. A7 delivers killer performance — up to four times faster CPU and up to eight times faster graphics performance than the previous generation — without sacrificing battery life. So you get incredible power in a device you can take with you wherever you go. iPad mini has everything that makes an iPad an iPad, but it’s a fraction of the size. At just 7.5 millimeters, it’s pencil thin and unbelievably light.3 You can easily hold it in your palm. And stash it in your smallest bag without a second thought, so it’s always close at hand. Also today, during their press conference held in California, Apple have announced the new iPad Air. 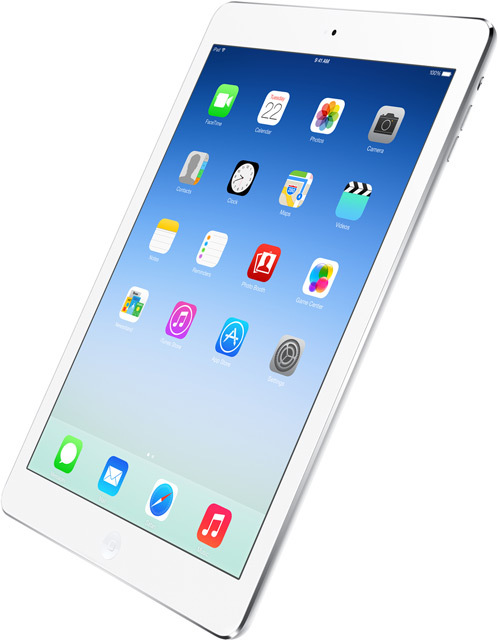 Thinner, lighter and more powerful that ever before, the iPad Air has a 9.7″ retina display. A much thinner, 43% thinner bezel surrounds the screen and at 7.5mm thick it’s 20% thinner than the iPad 4 and weighs in at just 1 pound! The lights full size tablet in the world! Having the same A7 CPU that we first saw in the iPhone 5s there’s also the M7 motion chip from the new iPhone. Today Apple have been treating us to another look at the Apple Mac Pro and updated us with new specification details and have announced the starting price of ‘just’ $2999 and it will be available from December of this year. Capable of real-time 4K video editing, extremely low power consumption on idle and as quiet as the Mac Mini. 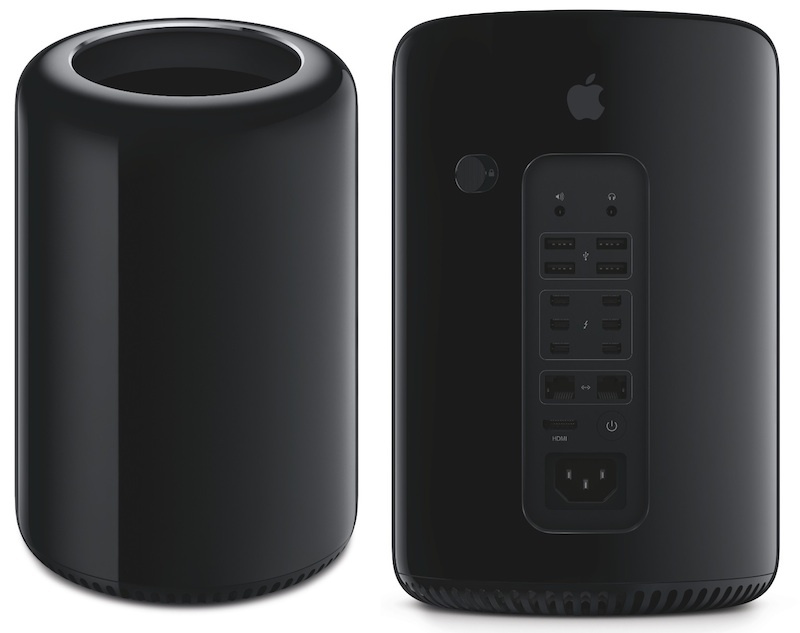 Engineered around workstation graphics with dual GPUs, PCI Express–based flash storage, high-performance Thunderbolt 2, new-generation Xeon processors, ultra-fast memory and support for 4K video, the new Mac Pro delivers state-of-the-art performance across the board. The new Mac Pro is muscle through and through, starting with the new-generation Intel Xeon E5 chipset. With configurations offering up to 12 cores of processing power, up to 40GB/s of PCI Express gen 3 bandwidth and 256-bit-wide floating-point instructions, you’ll never be at a loss for speed. Every component in the new Mac Pro is optimised for performance. That includes a four-channel DDR3 memory controller running at 1866MHz. It delivers up to 60GB/s of memory bandwidth, which means you can fly through even the most compute-intensive tasks in no time. And since it’s ECC memory, your render job, video export or simulation won’t be stopped by transient memory errors. Traditionally, pro computers have relied primarily on the CPU for their computing power. But as GPU performance has dramatically increased, software developers have begun to leverage that power in their apps. With the new Mac Pro, we looked ahead and engineered an even more powerful GPU architecture. Not only does it feature a state-of-the-art AMD FirePro workstation-class GPU with up to 6GB of dedicated VRAM — it features two of them. With all that power, you’ll be able to do things like seamlessly edit full-resolution 4K video while simultaneously rendering effects in the background — and still have enough power to connect up to three high-resolution 4K displays. At their press conference just now in California, Apple have announced that OS X Mavericks will be available to download from the App store from today, and the big news is that it will be free! Obviously we saw Mavericks first demonstrated a few months ago and since then there have been several beta versions made available to developers and just a few weeks ago the gold master version was also released. There are over 200 new features and enhancements in Mavericks including some optimisation methods built in to maximise battery life and and memory compression to make best use of the available RAM. 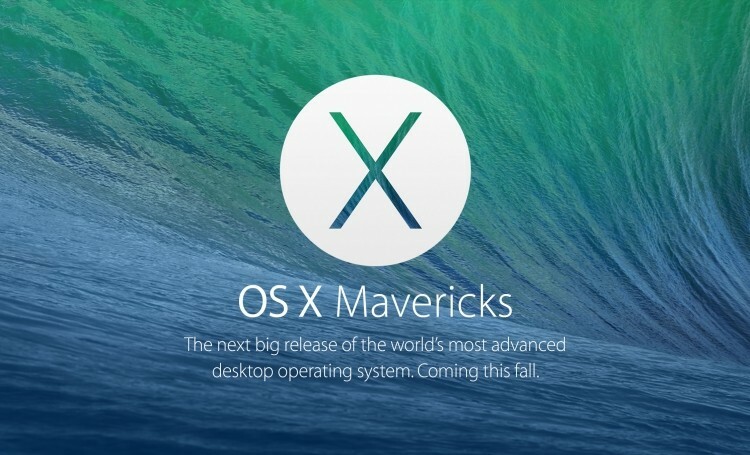 As mentioned before, OS X Mavericks will be FREE and available on almost every Mac! In OS X Mavericks, Timer Coalescing groups low-level operations together, creating tiny periods of idle time that allow your CPU to enter a low-power state more often. With its activity reduced up to 72 percent, the CPU uses less energy, giving your battery a break, too. This happens so fast you won’t notice a thing. And your Mac still gets just as much done just as quickly. App Nap helps you save power when you’re working with multiple apps at the same time. OS X can tell when an app is completely hidden behind other windows. And if that app isn’t currently doing something for you — playing music, downloading a file, or checking email, for example — App Nap conserves valuable battery life by slowing the app down. But as soon as you start to use it again, the app instantly shifts back to full speed. It’s so seamless you’ll think it had been running that way all along. App Nap works the same way with Safari tabs, so only the visible tab is running at full speed. With App Nap, CPU energy use can be reduced by up to 23 percent. The more memory your Mac has at its disposal, the faster it works. But when you have multiple apps running, your Mac uses more memory. With OS X Mavericks, Compressed Memory allows your Mac to free up memory space when you need it most. As your Mac approaches maximum memory capacity, OS X automatically compresses data from inactive apps, making more memory available. Nokia World 2013 is now in full swing in Abu Dhabi and things have started off with something of a bang as Nokia have announced 3 new devices right of the bat. Starting with the Lumia 1520 and 1320, both 6″ Windows Phone 8 devices, and also the much anticipated Nokia Lumia 2520 Windows RT Tablet. For the most part it has been a case of confirming most of what we had already heard about each product. The Lumia 1520 will have a 6 inch full HD screen, quad-core snapdragon 800 processor, 2GB RAM, 20 MP PureView camera and come with either 16 or 32GB of on-board storage. As for the Lumia 1320 you’ll find a 6 inch 720p resolution IPS display, Qualcomm Snapdragon dual-core 1.7GHz with just 1GB of RAM and a rather cut-down 5MP camera. Arguably the most exciting to be announced though is the Lumia 2520 tablet device. Whilst technically not the first tablet device from Nokia, the N700 and N800’s came way before, it will be the first that we’ve seen from Nokia to be of what we now commonly consider a tablet format. The 10.1-inch Windows RT tablet will have a 1920×1080 pixel resolution display and have a similar design to the other Lumia devices and will also be just 9mm thick. Full specs of each new product will follow soon. The Samsung Galaxy Express 2 will be a Vodafone exclusive from the 23rd October but other UK retailers will stock the phone from a yet undisclosed date. 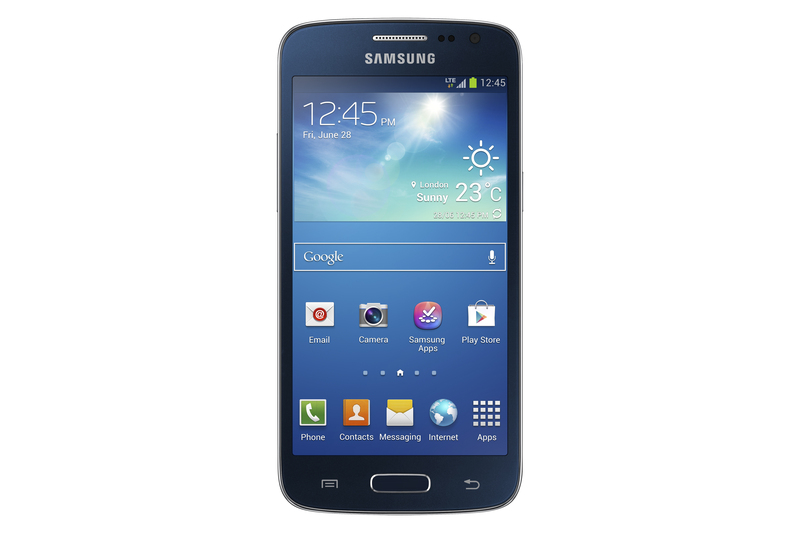 Looks like the Galaxy Express 2 will be popular, it has a powerful quad-core 1.7GHz CPU and a large, 4.5 inch display. No word in the cost as yet but if Vodafone can get the price point right I’d expect them to sell plenty of these. Announced back in September of this year, the BlackBerry Z30 emerges as the new flagship BlackBerry devices, taking over this spot from the existing Z10. With its 5.0 inch display, the Z30 is bigger than the Z10 and the screen technology has been changed to Super AMOLED. The advantage here is that AMOLED typically use less power than their LCD counterparts and this coupled with the 2880mAh battery should give the Z30 a healthy endurance. 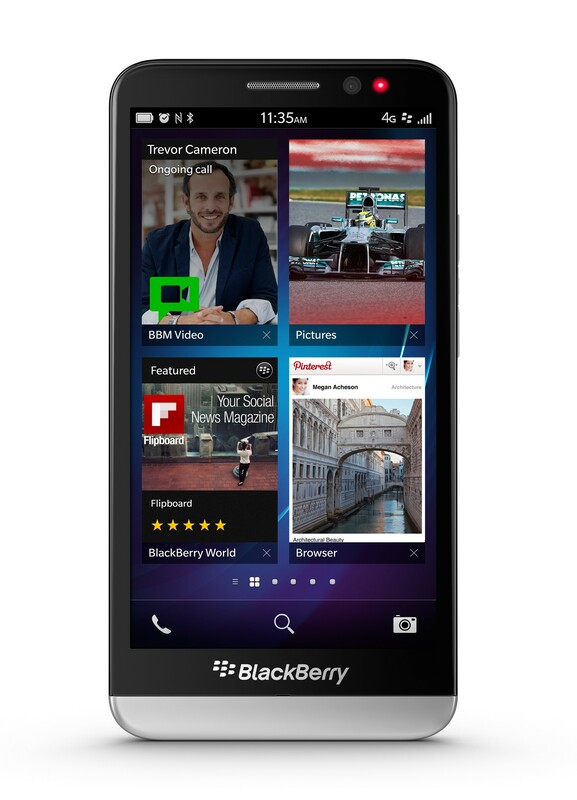 The Z30 is all touchscreen and comes with the latest iteration of BB10, running 10.2. Not a huge difference here but there are some updated and new features that we’ll cover in more detail in our review. When we first heard rumours of a new BlackBerry 10 device codenamed Aristo, it was said to be the “most powerful BlackBerry ever”. We now know that phone as the Z30 and inside we find a dual-core Snapdragon S4 Pro CPU clocked at 1.7GHz, 2 GB of RAM and 16 GB on board storage. Here we have an initial unboxing and demo video of the BlackBerry Z30 where I take a look at the hardware and some of the OS features. We must also say thanks to Unlocked-Mobiles.com for supplying the loan unit.